Welcome to the very first NEMESIS REVIEW on iSlaytheDragon. In this post, @FarmerLenny offers a review of a game, and @Futurewolfie adds his own thoughts afterward. Then, at the end, both summarize their general thoughts about the game in 5 words or less. I mentioned in my review of San Juan (which is posted here) that I didn’t particularly care for it. It seemed like it had elements of a good game, but something just didn’t click for me (perhaps it was fellow players burying all the good cards under their chapels?). It’s also telling that those I play board games with most frequently weren’t itching to play it either. I was offered Race for the Galaxy in a trade through BGG, so I thought I’d try San Juan’s beefier big brother before completely swearing off games of this type. So why did I love one game and not care for the other when they’re so similar? Let’s get into the review. 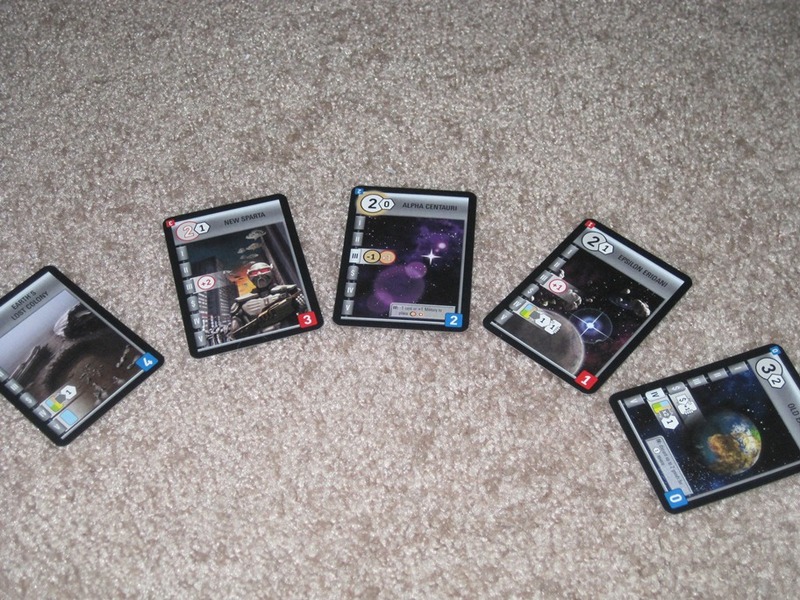 Race for the Galaxy (RftG) is similar to San Juan (SJ) in that each player chooses a phase, players participate in whatever phases are chosen, and if a player chooses a phase, that phase offers him some sort of privilege (called “bonuses” in RftG). There are a few differences, though, and these differences really set RftG apart. In SJ, for example, if one player chooses a role for its privilege, every player may participate, but only the choosing player gets the privilege. If another player wants the privilege, he must wait until the next round. 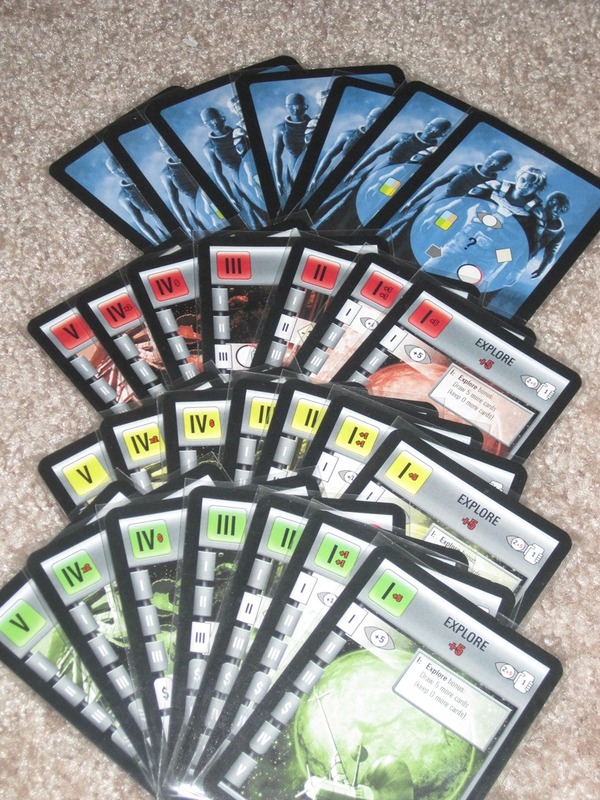 In RftG, every player has the same seven cards to choose from, which indicate the phases and bonuses. Players choose secretly and reveal simultaneously. Any phases chosen happen; all other phases don’t. So, if Jimmy chooses phase III (“Settle”) and Phil and I choose phase V (“Produce”), only phases III and V happen for everyone, but both Phil and I would receive the bonus for phase V. Basically, anytime you need a bonus for a particular phase, you can choose that phase. This eliminates the spite of SJ and makes for a more even playing field. Of course, there is a good deal of strategy in having simultaneous selection, too. If I see that Jimmy really needs to produce goods, I might hold off from choosing the Produce phase since I know he’ll choose it. (I would miss out on the bonus, but such is life.) This would allow me to choose a different phase that would be beneficial to me. The game involves a lot of guessing at what other players will choose and even bluffing to try to build up your own empire. I like the theme much better in RftG as well. SJ feels like it is trying to be the card game version of Puerto Rico (because it is). RftG, in contrast, is able to freshly come to the role-selection mechanic and pick and choose what works. Thus, instead of just “buildings” in your tableau, there are developments and worlds, which makes more thematic sense. The artwork is much more exciting in RftG, which keeps the game more engaging when your opponent/nemesis is taking forever to decide what he wants to do. 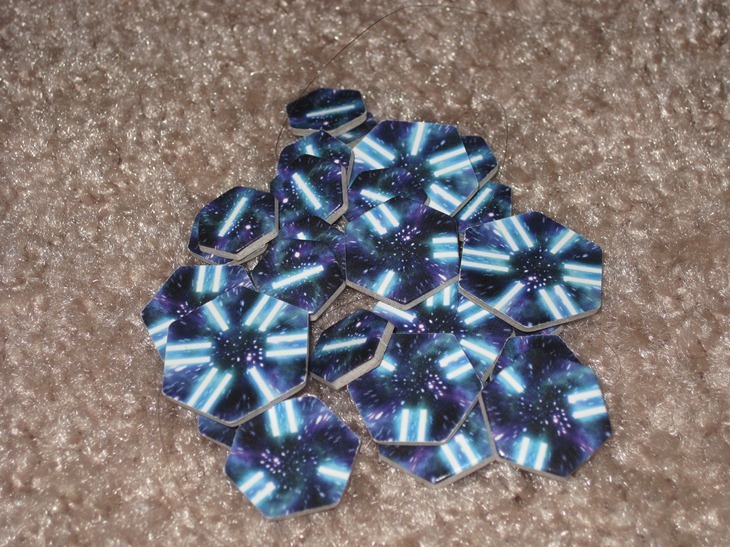 But what really sets RftG apart from SJ is the design. SJ is text-based and thus very easy for new players to understand. 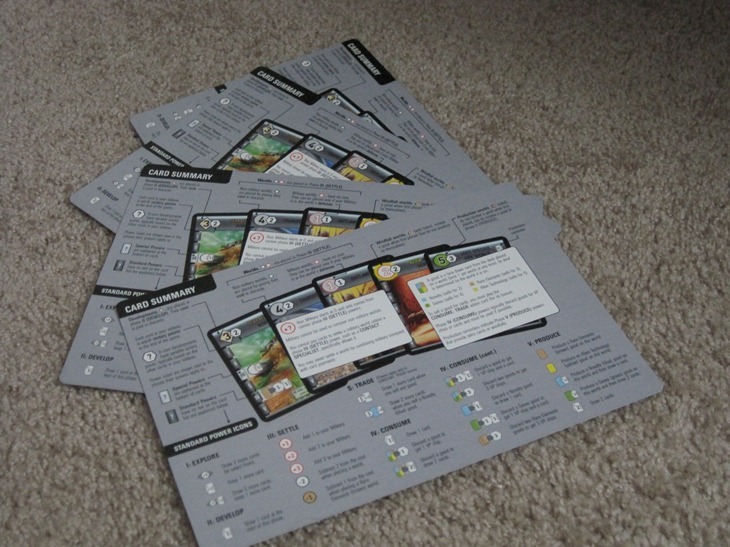 However, the way the cards are laid out, it’s harder to see when a card’s power is activated. The cards also suffer from imported English, which occasionally leads to some confusion over what the cards do. RftG, on the other hand, has a steep learning curve (see Wolfie’s earlier post on this subject), but this curve ultimately makes for a better game. It’s similar to learning the jargon of any field. In my field (editing), I could discuss grammar using words any person, even one who knows nothing about the subject, could understand, but this is unnecessarily verbose for those who trade in the subject every day. It’s much easier to say “gerund” than “verb phrase acting as a noun”; it’s worth it to learn the vocabulary if you’re going to spend any time in the field. In the same way, while the iconography in RftG is tough the first few games, after multiple games, it becomes second nature and ultimately makes for smoother gameplay. The only question is, which seat will you take? Really, my only complaint about RftG is that it is so tough to teach newcomers. I can teach Dominion in five to ten minutes, and new players more or less grasp what’s going on (especially after they see a sample turn or two). Unless players play open-handed, or players have played SJ, RftG takes much longer, and can even span multiple games. Thankfully, game length is one of the huge benefits of RftG. The game consistently lasts between 30 and 45 minutes (even with learning players), and it gives players a sense of accomplishment at the end of it. Over the course of less than an hour, you’ve built an empire you can be proud of–or one that mercilessly crushes all planets around it, or that overcomes all others by flooding the market with novelty goods. Okay, maybe not one you can be proud of, but you can revel in the victory nonetheless. And revel I do. Trading SJ for RftG was an excellent decision, and I don’t regret it at all. Allow me to start off by referencing a previous post I’ve written regarding iconology, which FarmerLenny alluded to a few paragraphs above. In said article, I complained about the confusion caused by RftG’s numerous tiny icons. I want to follow up that post by stating that after playing RftG several times, the icons are much easier to ingest. They certainly do offer a quick at-a-glance summary of what a card accomplishes, though some of the more complex icons require a closer glance and study, as well as the accompanying text, to make sense out of the ability. I still hold that it was initially extremely overwhelming, to attempt to learn a new game system as well as all the icons. Fortunately the cheat sheet is very helpful. I don’t need to go into much detail, as FarmerLenny covered things pretty well in his section. I generally agree that RftG is a quality, fun game that requires strategy, planning, and risk in order to win. However, I would like to add some additional qualms – my point here is not to put down the game, but to mention some frustrations that I have had while playing. FarmerLenny mentioned that cards interact in different ways, allowing for varying strategies and preventing any single card from being the all-too-powerful must-have card. The most powerful cards are only powerful to a specific strategy, and worthless otherwise, making it a pretty big sacrifice to lay down a card just to prevent someone else from getting it. The problem I’ve run into though, is that sometimes the luck of the draw can really hurt your strategy if it happens at the wrong time. Like FarmerLenny said, your home planet often dictates, or at least strongly suggests, a prime strategy to pursue based on its initial special abilities. However, unlike, say, Dominion, in which all cards are available and you choose which to start with and how to build your deck… you must rely on the cards you draw from the deck. This means that your well-thought-out strategy can be ruined by bad luck. There are methods to try and circumvent this bad-luck scenario. Exploring with the +5 look modifier lets you pull out a large number of cards and only keep the one you need, greatly increasing the chances of finding the best card for you. However, sometimes it’s still possible to not find the cards you need at the right time. For example, production worlds tend to be more valuable if you can place them early, and gain a lot of victory point tokens via producing and consuming. But if you’re not getting production worlds… you’re in trouble. Take the most recent game I played. I was trying to build a system of rare production worlds – my starting planet as well as cards in my initial hand were of great help to settling on those types of worlds. Unfortunately, after my first few cards, I suddenly stopped drawing rare production worlds – in fact, I could find production worlds at all. Even when I explored with +5, I wasn’t pulling in great cards. I spent too much of the game just trying to find those production worlds I needed, and by the time I had built up my system of worlds and developments that were excellent for production… the game ended. Because of how the cards had come up, I got stuck unable to make the moves I needed to win. In fact, FarmerLenny kept drawing the cards I needed (by luck) and used them as discards to pay for his own cards. Cheat sheets help players learn the erstwhile inscrutable icons. It may be that I just haven’t quite gotten down the strategy for this game, but each time I end up feeling a little frustrated at how the cards seem to go against me. If you don’t find the planets or developments you need, you can fall behind – and since there’s no way to produce multiple developments or settle multiple worlds in one turn, it can be hard to catch up if you hold off on building or colonizing til you find the right card. I also favor the game with more than two players. It’s fun regardless of how many players you have, but with 3 or 4 players you have a greater chance of pulling the same phase as someone else. It adds sort of a risk-reward element as you try to guess what others will play. Do you go straight for the bonus that will directly help, or do you go for a phase that you don’t think anyone else will pick so you can do something extra during your turn? Of course, that would mean allowing all the OTHER players to get more actions as well. I think that part of the game is the most fun – trying to guess what the other players will play and adjust your strategy accordingly. Want another opinion? 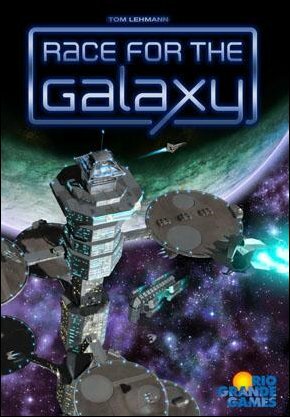 Check out Play Board Games’ Race for the Galaxy review or the Race for the Galaxy review on Games with Two.